Area Sales Statistics Developments Disclosures & Contracts Foreclosures & Bank Owned Investments Jay's Expertise Land New Homes Property Search Real Estate Web Forum News Articles About The Smokies Services Provided Utility Information What's In It For Me? If this Smoky Mountain real estate post was helpful, please share it! 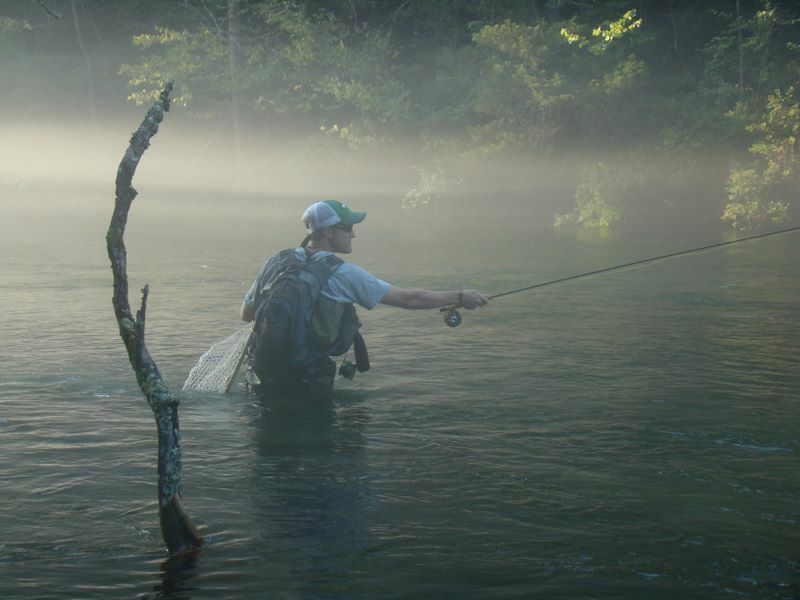 Lately it has been difficult for me to break away and devote some time to go trout fishing here in our beautiful Smoky Mountains. One of my clients had expressed an interest in going and my cousin, John, from West Virginia hadn’t been down in a while to go fishing, so I figured now would be as good of time as any. My cousin, John, is quite the outdoorsman. He comes from a family where his dad brought him deer hunting in the woods of West Virginia before he could walk. He carried him in his Carhartt’s as he sat out in the silence of the woods bow hunting. Apparently, my cousin was quite well behaved and quiet for his age – either that or he must have slept the whole time! John and his brother Ian have been hunting and fishing avidly for at least 20 years now – basically since they were old enough to carry a gun or pick up a pole! More recently, John has got into trout fishing and fly fishing. 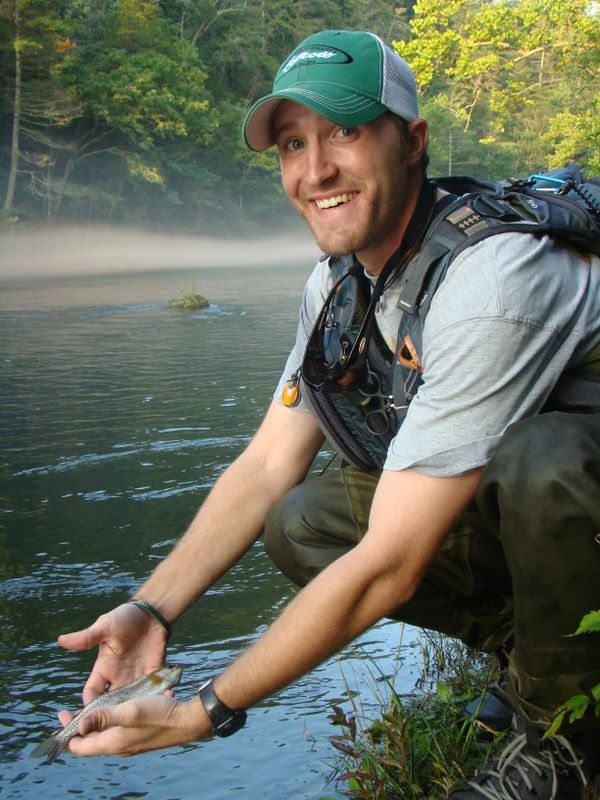 John got introduced into trout fishing in the mountains of West Virginia, more specifically the Williams River, Cranberry River, Gauley, and Elk River. My Uncle John and my cousins would frequently go up to the rivers and streams in the mountains and catch their limit of stocked trout within an hour frequently. They are quite the fisherman, able to read the water and have perfect presentation to the trout. I had joined them several times and was amazed at the ease they would catch fish. One of my earliest childhood memories was to my Papa’s cabin near the George Washington National Forest in West Virginia, fairly close to Washington D.C. Surprisingly, my cousin John is the only one who really took a liking to fly fishing. Once he got hooked, there was no turning back. 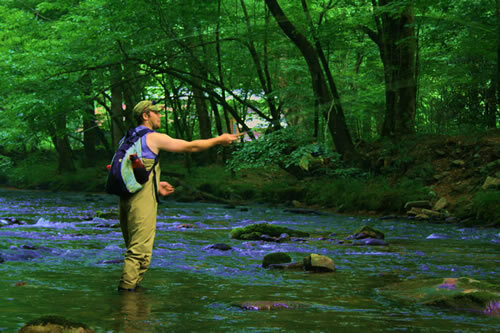 John now ties all of his own flies, made a custom handmade bamboo rod for himself, and he frequently bushwhacks through the remote West Virginia wilderness in search for native brook trout. 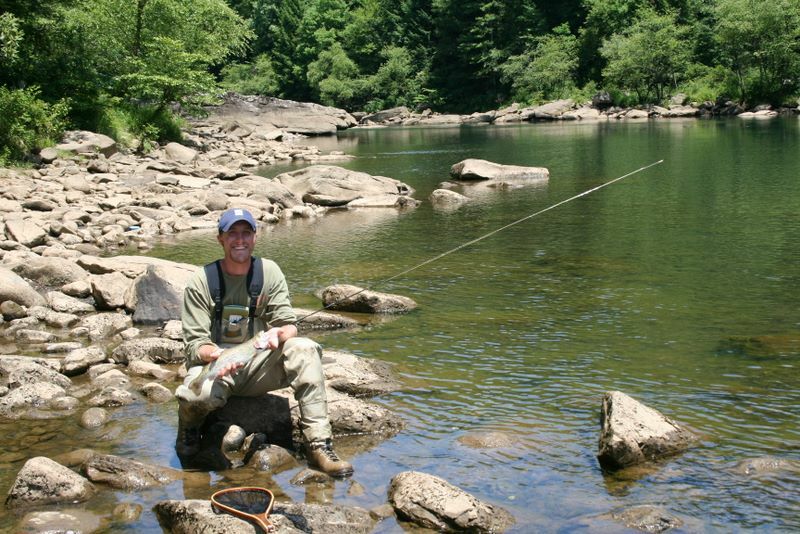 John was coming into town from West Virginia, so it only made sense to fish the South Holston River on his way into Sevier County – as he had to pass by it anyway. 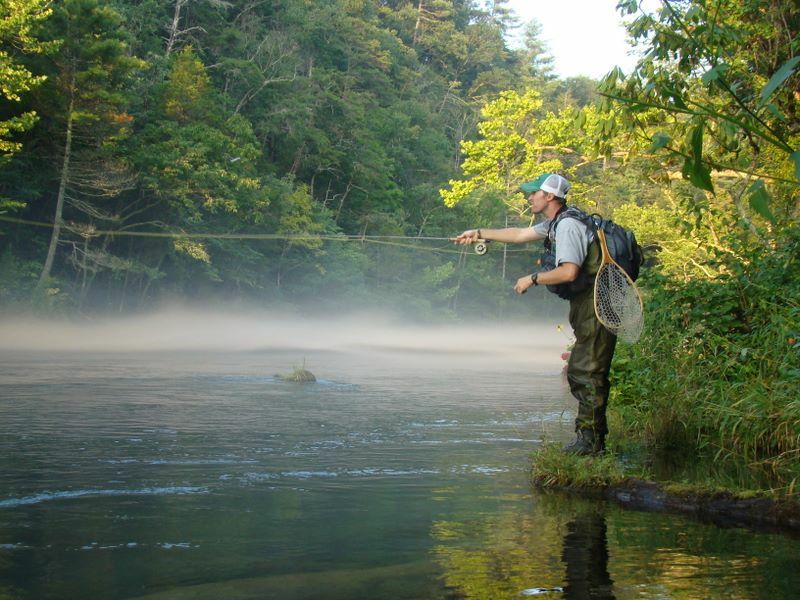 The South Holston River is known for its tremendous fishing opportunities for large brown trout and its perfect conditions for holding trout including its oxygen level. We had a lot of rain in the area the past week, so we were somewhat skeptical of the fishing conditions. Since we were going to be wading the river instead of floating, the Holston Dam generation schedule was also an issue. Unfortunately, we had bad luck on both accounts. They were generating when we were fishing and the waters were very high, making it extremely difficult to wade and fish. Fishing from the banks and being able to wade only about 20 feet into the wide river made it difficult to get the best angles to present our flies to the waiting trout. There were several hatches coming off that evening, so the potential was there. My brother in-law, Paul, who is from Bristol, TN met us at the Weir Dam at about 4:00 so we could do some fishing until dark. Both John and I looked at Paul in his neoprene waders and thought he would burn up with the weather being as hot as it was. We were certainly in for a surprise though as we entered the water, the South Holston was frigid, or so it seemed. The water temperatures were good for trout fishing – in the mid to upper 50′s while we were there. John managed to pull in two brown trout off the South Holston, while the rest of us came up empty – unless you count the small shiner/chub that I caught! The fog on the river made it somewhat difficult to see our flies, but made for some interesting pictures. After we got done fishing, we loaded up, got some grub, and then headed back to our house in Sevierville. We arrived just before midnight and had to get up early the next morning to fish. John had wanted to visit Little River Outfitters in Townsend, so we decided to fish the Little River that day due to its close proximity.